This review first appeared in the December 13, 1996 issue of the North County Times. 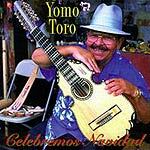 Guitarist Yomo Toro brings the Christmas traditions of Puerto Rico to the mainland on this release. There's not much here in the way of traditional Anglo Christmas fare. And to those unfamiliar with the Puerto Rican holiday songs, it may sound more like an outstanding Latin dance album (as if that were a bad thing!). The one nod to the snow-covered canon is a rocking instrumental version of "The Christmas Song." The chestnuts were never so hot.